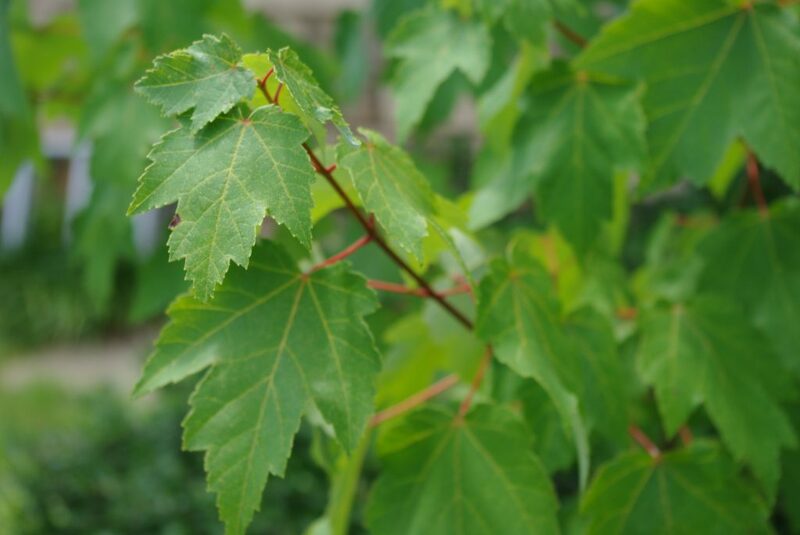 Acer rubrum, canopy tree to 35 m; life span to 150 years; branches and twigs ascending or spreading, new twigs red, usually elongate and curved upward, often in opposite pairs if both survive; bark smooth, silver-gray on young trees, coarsely, irregularly fissured on older trees; roots fibrous, growing horizontal mostly in the top 25 cm of soil, non-woody feeder roots grow upward from larger roots and occupy the top 8 cm of soil (Burns and Honkala 1990), roots associated with arbuscular mycorrhizal fungi (AM) (endomycorrhizae, Zygomycotina, order Glomales, family Endogonaceae) (Decker and Boerner 1997; Carreiro 1999); winter floral buds dark red, with 6-10 overlapping scales, in dense, knobby clusters wider than twig, surrounding leaf bud; each bud producing several flowers on short stalks. Leaves opposite, stalk to 10 cm long or more, often reddish (Yatskievych 2006), blade 6-15 cm wide and about as long, shallowly, sharply 3-5 palmately lobed, middle lobe 3-8 cm long, lateral lobes smaller, tips long-pointed (acuminate), base slightly round-lobed; underside whitish; major veins palmate; margin coarsely double toothed; leaves expand late April-mid-May; winter plant leafless 160 days (Britton 1874). 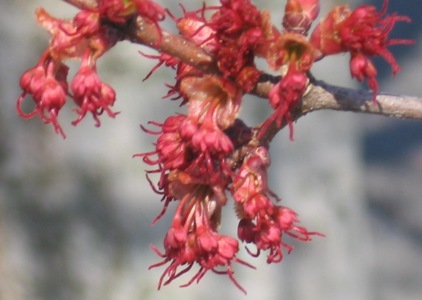 Acer rubrum staminate flowers. U. Alabama. New Page 1. Catagories of Flowers jb004.k12.sd.us (Accessed 5/2018). 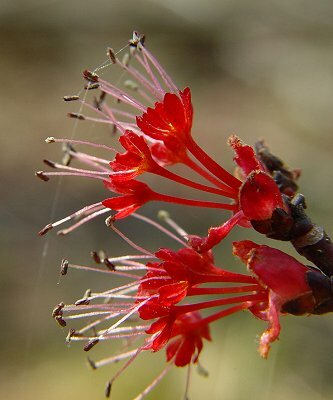 Flowers bright, deep red to occasionally dull yellow; radially symmetrical, small, generally structurally perfect and sometimes hermaphroditic (both sexes functional), but usually functionally or fully monoecious, male and female flowers usually on different branches (Burns and Honkala 1990), sepals 5, about 0.1 cm long, petals 5, slightly longer and narrower; male flowers in dense head-like (capitate) clusters, stalks short or none, stamens several; female flowers with ovary superior, two parted, styles 2, stigma along inner side of each; wind pollinated; female inflorescence of dense flower clusters, becoming umbrella-like as the thin fruit stalks elongate; blooms March-April, several weeks before leafing out occurs (Fernald 1950; Yatskievych 2006). Wind pollinated https://www.na.fs.fed.us/pubs/silvics_manual/volume_2/acer/negundo.htm). 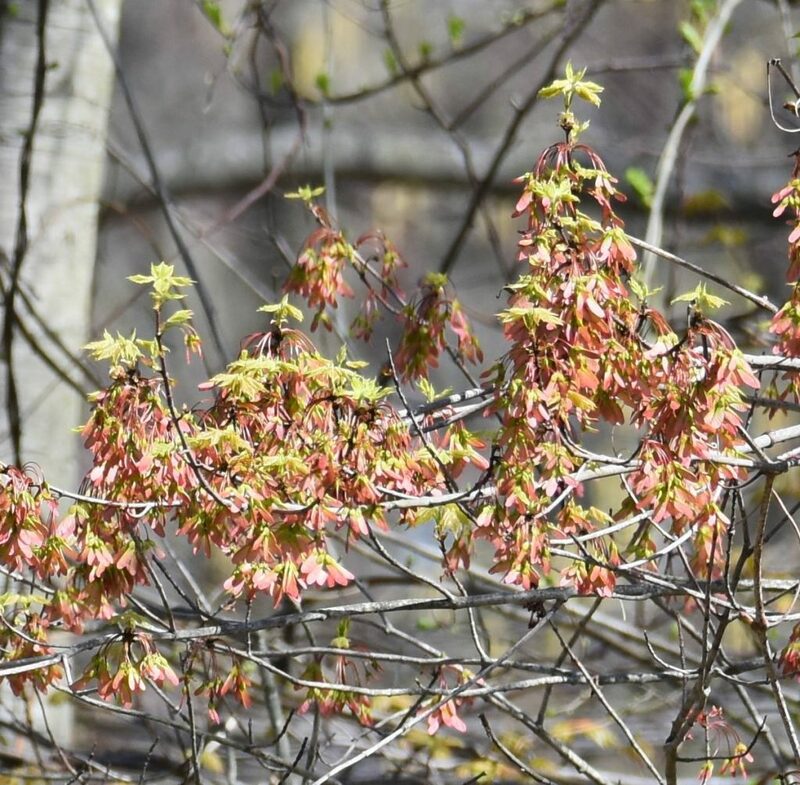 Acer rubrum young fruit and new leaves. Andrew Greller. Hempstead, L.I., NYS. 5/2018. Acer rubrum fruit close-up. By Arthur Haines. Copyright © 2018. New England Wild Flower Society. gobotany.newenglandwild.org (Accessed 5/2018). Habitat: Moist woods to swamp forests, but also occurs on drier upland sites. 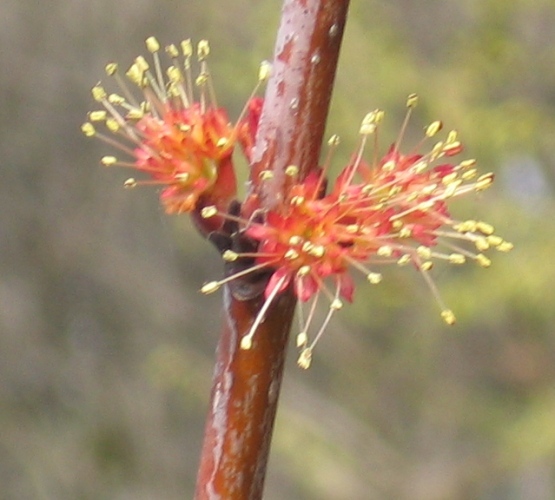 At least one study indicates that there may be genetic differences between wetland and upland populations of red maple (Anella and Whitlow 2000). 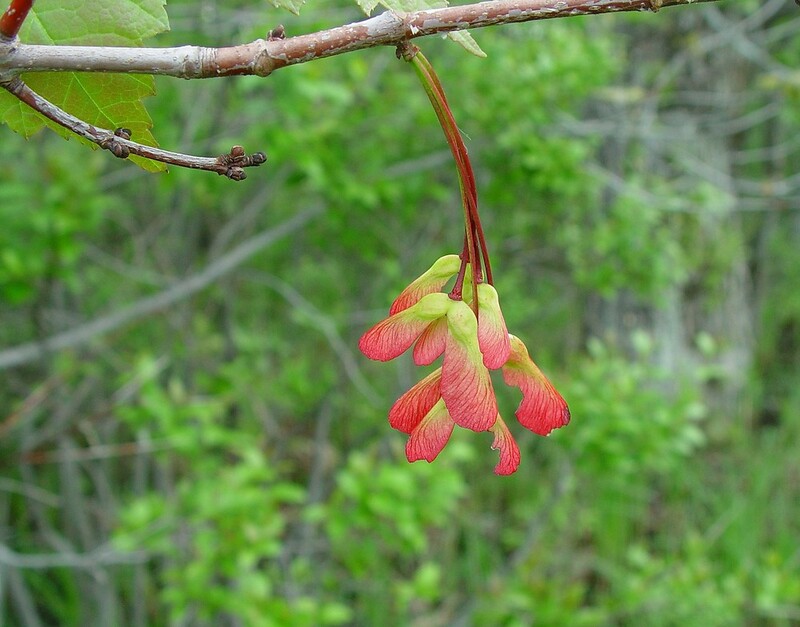 Red maple is common as a pioneer tree in second growth but is also a shade tolerant dominant in some swamp forests (Bazzaz et al. 1972). Notes: Probably becomes established in old fields and previously disturbed sites from 6-12 years after abandonment (Peroni 1994). Prefers soil pH 4.5-7; found on soils pH 4.4-5.6 in New York City (Gargiullo, unpublished data). Tolerant of flooding, saturated soil up to 25% growing season, ozone, soil compaction; shade index 6-8. Moderately tolerant of drought. Intolerant of salt (Hightshoe 1988). Leaves that develop in full sun cannot use more than 22% full sun (saturation point), while leaves that develop in shade cannot use more than 8% full sun (Hicks and Chabot 1985). Small trees tolerate periods of slow growth in forest understories but can grow rapidly in high light of the tree canopy (Wyckoff and Clark 2002). Stump sprouts if cut or burned; growth may be inhibited by chemicals produced by Black cherry (Prunus serotina); buds, flowers, seeds and twigs eaten by birds and mammals (Martin et al. 1951); Yellow-bellied sapsuckers (Sphyrapicus varius) often damage trees in spring (Rushmore 1969), squirrels bury seeds (Gargiullo personal observation), seedlings eaten by meadow voles, Microtus pensylvanicus (Ostfeld et al. 1997); trees attacked by Inonotus glomeratus, Oxyporus populinus and other fungi (Burns & Honkala 1990; Wayne et al. 1987). A host tree of the Asian longhorn beetle, Anoplophora glabripennis (see Norway maple). 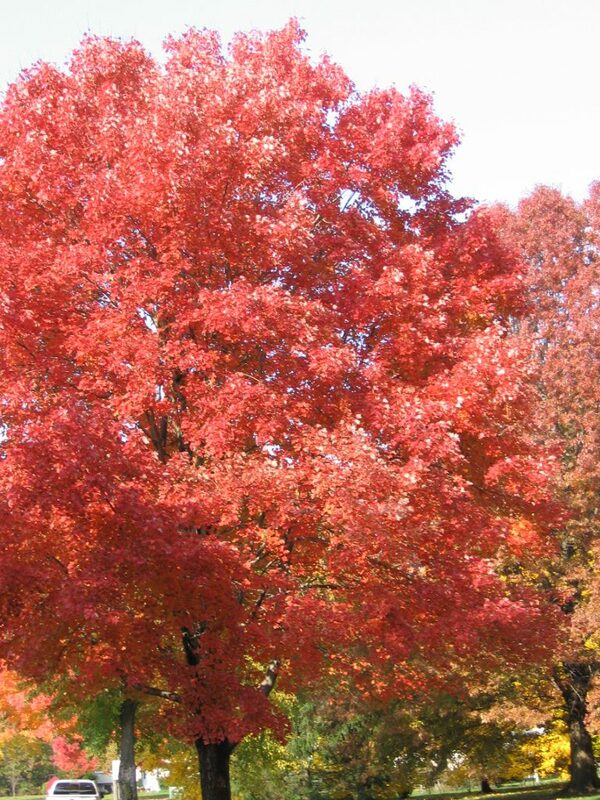 Photo: Acer rubrum.commons.wikimedia.org.